Next up in our "We really need to make a TJ's run" series: grated parmesan cheese. This stuff always enhances pizza. In pizza places, it's usually right next to the big red pepper flakes in a glass shaker with a shiny aluminum screw-on top with little holes. It's one of our top two favorite pizza-related condiments. It's also good for pasta. 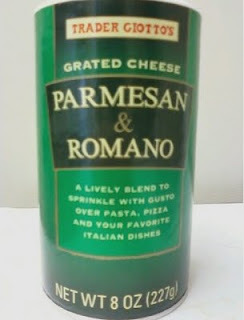 And our good buddy Trader Giotto hooked it up with not just parmesan cheese, but another Italian classic: Romano cheese. Booyah! As the container directs, one must sprinkle this cheese with gusto onto his or her food. A lack of gusto may diqualify you from further use of this product. Mama Mia. The dispenser has one of those twisty-turny tops where you can choose to put the little holes over the opening in the top of the container if you want to gently sprinkle the product onto your pizza, or you can choose the huge gaping hole if you want to just dump a giant pile of cheese on your food. I might also mention that this is imported cheese. Really. That's what the container says. Why can't we make a decent parmesan cheese here in the US? I don't know. Maybe the flavor is enhanced in transit somewhere between here and the cheese's unspecified origin, which of course we are led to believe is Italy. At any rate, it is tasty. But really, what can you do to make a parmesan cheese better than any other run-of-the-mill parmesan cheese? Add Romano. That's what TJ's did. It's that kind of out-of-the-box thinking that puts TJ's versions ahead of any other brand. Good job. We like it. Double 4's. I was disappointed in this product. It has a weird grainy texture I've never seen in canned sprinkle cheese. You can get Parmesan Romano from Kraft or the store brand which has the normal powdery texture I've come to expect. Wow - we like this one infinitely more than the usual Kraft (which tasted like sawdust powder). 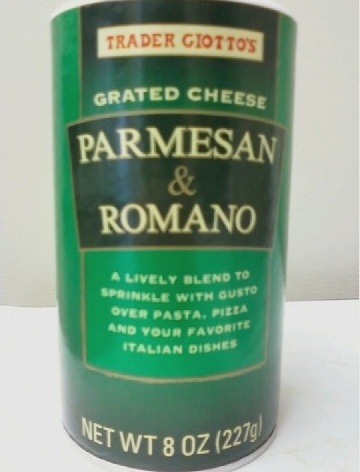 TJ's parmesan romano has a surprisingly pleasant flavor. We agree - good job TJ's! Does anyone know why this item was discontinued? I heard it was price. I miss having it so bad!!!! I used to buy this product every two weeks. My visits to Trader Joes have been reduced because of this out of stock item. It was recalled because a lot of them had mold. They are looking to find a replacement. Does it have any animal enzymes or rennet in it?